For the March 2019 issue of Compañeros Dominicanos, the DDG's bilingual news magazine, click this image. The Dominican Development Group publishes a monthly newsletter (Companion News), a quarterly bilingual magazine (Compañeros Dominicanos), and brochures and other miscellaneous publications. 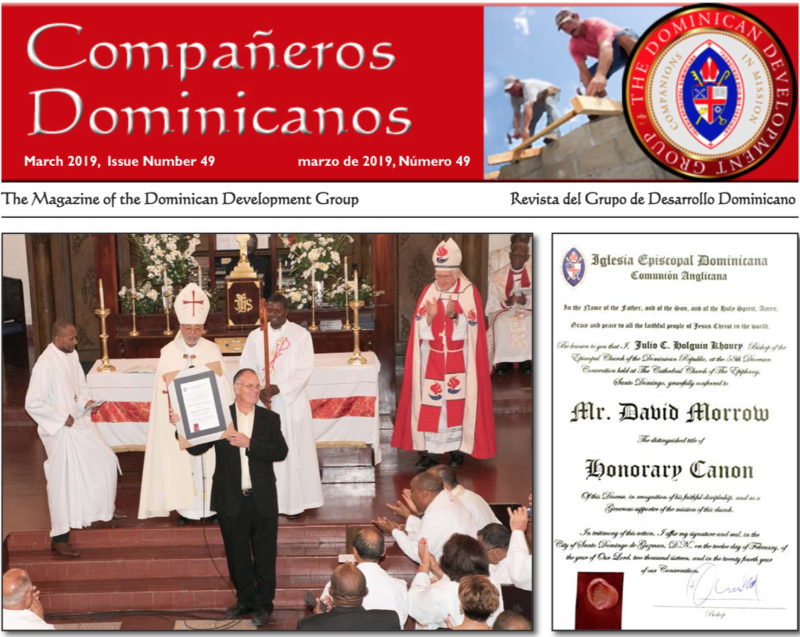 The DDG’s magazine, Compañeros Dominicanos, was formerly named the Joint CD Newsletter. Copies of the newsletter and the magazine are archived online at the links below. Other publications are linked below the magazine and newsletter. The Christian Education Committee of the Diocese of the Dominican Republic has created a Vacation Bible School booklet for use in the summer of 2018 with older children who can read. The original Spanish version is available here, and the English translation is available here. Another version of the booklet for younger children who cannot read is available here. Copies of these booklets can be printed in the Dominican Republic and delivered to a mission team worksite for US$1 each. To make arrangements for this printing and delivery, contact Missionary Karen Carroll <drequipos@gmail.com>. The 2017 and 2016 VBS booklets are also available. For the 2017 booklet designed for younger children, click here. For the 2017 booklet designed for older children, click here. For the English text of the 2017 lessons, click here. For the 2016 booklet designed for younger children, click here. For the 2016 booklet designed for older children, click here. The DDG is collecting sermons on the topic of mission work in the Diocese of the Dominican Republic. Suggested additions to this collection may be sent to the website editor at (communications@dominicandevelopmentgroup.org). Emily Gibson, a longterm volunteer working in the Mission Team Support Office of the Diocese of the Dominican Republic, is working in collaboration with the DDG to compile brief histories of all of the churches in the Dominican Episcopal Church. These histories will be posted on this webpage as they are completed. Mission teams often use prayers in their daily devotions that are written for their specific work locations and types of activities. A collection of these prayers is available below. If your mission team has a prayer that could be added to this section, please send it to communications@dominicandevelopmentgroup.org. The Dominican Development Group is collaborating with the Communications Committee of the Diocese of the Dominican Republic to post an interactive map of the Episcopal churches, schools, and other institutions in the Dominican Republic. All of the locations are not plotted yet, but new ones are being added weekly. The locations will feature exact GPS coordinates and photographs. To access this map, click here. November 2013: Why Go on a Mission Trip?